During the study, published Nov. 30, 2017, in the journal Cell, a team of researchers led by graduate student Michael Topper; research associate Michelle Vaz, Ph.D.; and senior author Stephen B. Baylin, M.D., combined a demethylating drug called 5-azacytidine that chemically reignites some cancer suppressor genes' ability to operate, with one of three histone deacetylase inhibitor drugs (HDACis). The HDACis work against proteins called histone deacetylases that are involved in processes, such as cell copying and division, and can contribute to cancer development. 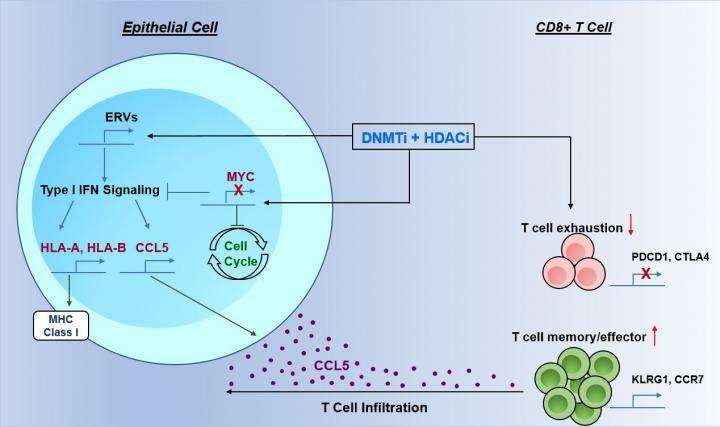 The combination therapy triggered a chemical cascade that increased the attraction of immune cells to fight tumors and diminished the work of the cancer gene MYC. Based on these findings, investigators have launched a clinical trial of the combination therapy in patients with advanced, nonsmall cell lung cancer. The development of therapeutic approaches for patients with lung cancer has been a critical medical need, says Baylin, the Virginia and Daniel K. Ludwig Professor of Cancer Research at the Kimmel Cancer Center. While immune checkpoint therapy has been "a tremendous step forward, less than half of patients with lung cancer have benefited to date," he says. "In our study, the two-drug epigenetic therapy combination worked exceedingly well, even before putting in the immune checkpoint inhibitors," Baylin says. "In animal models of lung cancer, the two agents either prevented cancer from emerging or blunted the effects of more aggressive cancers. In both scenarios, a large component of the results involved an increase in immune recognition of the tumors." Baylin and colleagues at Memorial Sloan Kettering Cancer Center in New York and Fox Chase Cancer Center in Philadelphia have started a phase I/Ib clinical trial to evaluate if giving mocetinostat with a 5-azacytidinelike drug called guadecitabine can boost immune checkpoint therapy responses in patients with advanced, nonsmall cell lung cancers. The trial is part of the Van Andel Research Institute-Stand Up To Cancer Epigenetics Dream Team and is funded by Merck through the Stand Up To Cancer (SU2C) Catalyst program, an initiative led by SU2C to bring innovative cancer treatments to patients quickly. Matthew Hellmann, M.D., an author on the paper, will lead this trial at Memorial Sloan Kettering, and Jarushka Naidoo, M.B.B.Ch., assistant professor of oncology, will lead at Johns Hopkins. For more information, click here. The work was supported by grants from the Hodson Trust, the Dr. Miriam and Sheldon G. Adelson Medical Research Foundation, Stand Up To Cancer's Jim Toth Sr. Breakthrough Lung Cancer Research Award, the Commonwealth Foundation for Cancer Research and the Samuel Waxman Cancer Research Foundation Collaboration for a Cure. It also was supported by National Institutes of Health grants (CA12113, CA006973, CA180950) and the Van Andel Research Institute-Stand Up To Cancer Epigenetics Dream Team.